The young woman (in the dream) was rejoicing with me that she was over the roughest part of psychological growing up now. But at the same time she seemed to be trying to let me know that her life from here on in might not take the conventional paths of love-marriage-children and so forth. I could only hug her and in turn reassure her that it didn’t matter what forms the outer life took as long as individuation took place. Of course I was embracing myself. Would that the dream was, in fact, indicating that the workings of Dissolution and Separation with even, perhaps, the beginning of Conjunction have begun…. This entry was posted in Journal, Uncategorized and tagged alchemy, Jung on February 17, 2016 by Barbara Wade. So what comes after the incendiary experience of Calcination? 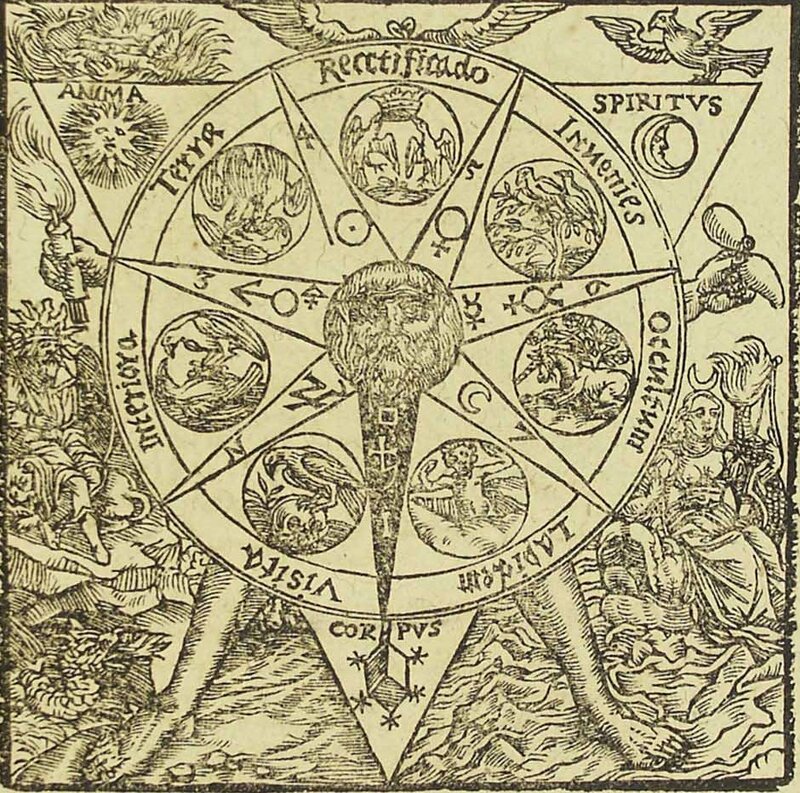 I need to memorize the alchemical stages of the soul’s transformation: Calcination, Dissolution, Separation, Conjunction, Fermentation, Distillation, Coagulation. Coloring and painting my version of the Azoth (the meditative emblem signifying Mercury, or the One Thing, the “A to Z” of all matter—my alchemist in the center being female) should help to cement the process in mind and body. Thank you, Dennis William Hauck, for your “alchemy made easy” book, The Emerald Tablet. The Tablet is now much more accessible and a much-needed complement to my other heretical studies. This entry was posted in Journal, Uncategorized and tagged alchemy, Emerald Tablet on February 16, 2016 by Barbara Wade. I am hit with the combined force of all the physical functions at once and at full blast—”horse,” “carriage,” “servant-driver”, feelings, body-instincts, intellect. An alchemist would probably diagnose the condition as the soul being CALCINATED, the excess (desire) being burned to ash for the eventual release of essential Self. I turn to alchemy for prognosis. DISSOLUTION is next, it seems. Can’t say as I’m looking forward to it. The good news is, I have the feeling it’s already begun, in the form of letting-go, letting “things” go, not “efforting” as much (as the current lingo would put it), giving up (some) of the tendency to name, analyze, label for the sake of simply feeling (experiencing). This entry was posted in Journal, Uncategorized and tagged alchemy on February 14, 2016 by Barbara Wade. An email from the Gurdjieff Foundation today informs me that this is the anniversary of the death of Lord John Pentland, long-revered president of the Gurdjieff Foundation in New York. Fitting he should leave the planet on Valentine’s Day. For what is arising into new consciousness but another form of falling in love? And who’s to say that it isn’t the ultimate experience of being in love? Like other equivalent experiences in my life, this one is as painful as it is life-giving. Maybe more so. I am barely a novice at this—the teachings, “the Work”—yet I burn, in the full sense of St. Paul’s usage. Something big is happening to me that only alchemy, Kabbalah, and now perhaps, the Work can help me through. This entry was posted in Journal, Uncategorized and tagged alchemy, Gurdjieff, Kabbalah on February 14, 2016 by Barbara Wade.